Tamagotchi has traditionally been targeted to kids and the game's easy-to-understand navigation follows that method. After entering a profile, the first menu displayed has three options, one of which is "Demo" (providing quick and easy access). The opening credits are mostly skippable and download time is respectable at under a minute. The menu options are on-screen buttons with clearly defined borders. Taps are read easily. The game's touch screen controls consist of tapping, dragging, and drawing. The game is pretty easy to play overall, and the two types of shops made available in the demo are very different, which highlights the game's range. In game items and commands react exactly as expected. So of the touchier, more sensitive skills required (like the drawing and icing flourettes in the Bakery) don't necessarily place as consistantly as they could, but it's not detrimental to gameplay and isn't likely to discourage anyone from looking into the game further. The look of Tamagotchi Connection: Corner Shop is simplistic, bright, and almost childish... which fits in perfectly with the rest of the Tamagotchi line of... everything. The sounds, which include sound-effect speech and repetitive background music, are unnecessary (in other words, listen to your music instead if you want). What's included, however, is really impressive. The demo is exactly what a demo should be... it includes an excerpt of actual gameplay, it provide choices, and tries to sell the game by showing off some of its highlights. 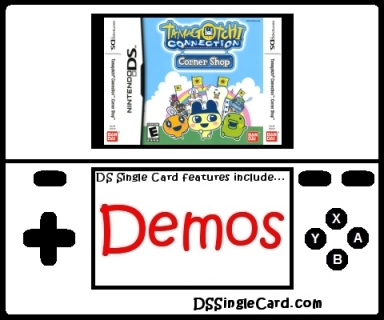 Tamagotchi Connection: Corner Shop takes demos to the next step, however, providing the one ability that all demos should have when it comes to trying to sell the game: include a benefit for the main, single-player experience every time your share the demo with someone. That way, people that enjoy the game will actually want to spread the word! To be perfectly honest, I came into my review of Tamagotchi Connection: Corner Shop with the expectation of finding a poor game that existed only to sell the toys, and I was very pleasantly surprised. What I found was a game that could be played by children, but is also fun in a quirky, Japanese-type way (appropriately so). I played each part of the demo (Dentist and Bakery) several times and, in fact, found myself looking forward to the main single-player experience. Now don't me wrong: I'm not saying this is the greatest game available, and have some requests for changes (see below), but it IS fun and I recommend anyone that enjoys the traditional quirky Japanese style to try it out (hey, I'll send you the demo!). Randomize the cake requests (Bakery) to enhance demo replayability. Increase control accuracy for drawing (Bakery). Provide additional options of shops.